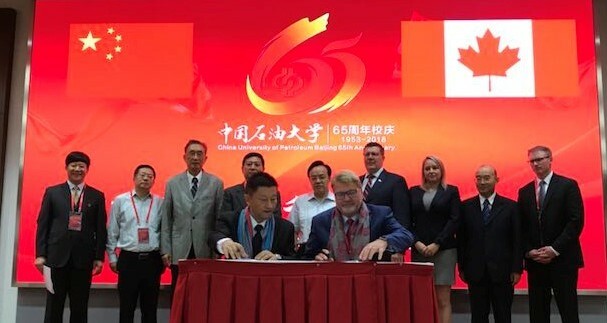 Beijing – Saskatchewan Premier Scott Moe was on hand to witness the most recent signing of a Memorandum of Understanding (MOU) between the Canadian based, International CCS Knowledge Centre and a Chinese organization while on his trade mission to China. This is the seventh MOU, in China, for the International CCS Knowledge Centre - demonstrating the global cache and high demand for Saskatchewan’s expertise in Carbon Capture Utilization and Storage (CCUS). The MOU - signed with the Laboratory of Greenhouse Gas Storage and CO2 Use for Enhanced Oil Recovery of Beijing (Beijing EOR Centre) – provides the opportunity for the International CCS Knowledge Centre and the Beijing EOR Centre to work together to accelerate the development, demonstration and deployment of CCUS to reduce greenhouse gas emissions and advance its commercial application. Based on the lessons learned from both the Boundary Dam 3 CCS Facility and the EOR operations in Saskatchewan, the International CCS Knowledge Centre will share knowledge and best Canadian practices in areas of: technical guidance; capacity building; and informing on regulatory and policy considerations as it relates to carbon dioxide (CO2) capture, transport, utilization (including enhanced oil recovery); and storage. at the CCUS Forum in China. The signing of the MOU followed Premier Moe’s keynote address, at the 2018 CCUS Forum held at the China University of Petroleum. Where he talked about Saskatchewan’s global leadership in CCUS. CCUS innovation and expertise is recognized as one of Canada’s profound knowledge exports. In December 2017, Minister of Environment and Climate Change, Catherine McKenna witnessed the signing two MOU with the International CCS Knowledge Centre during her mission to China. "We are delighted to work with the Beijing EOR Centre to share knowledge and expertise that has the dual purpose of taking real, concerted action on climate change by removing CO2 emissions at source and helping sustain economy and energy security." Currently the International CCS Knowledge Centre has six additional MOUs with agencies in China. with the Research Institute of Shaanxi Yanchang Petroleum (Group) Corp. Ltd.; as well as the China National CCUS Centre in Shaanxi (click here for further details). with the Sinopec Nanjing Research Institute of Chemical Industry and China Huaneng Clean Energy Group (click here for further details). with China Building Materials Academy and Sinopec Energy Saving and Environmental Protection Engineering Technology Co., Ltd. (click here for further details). Beijing EOR Centre is one of the leading research institutes involved in CCUS research including mechanism of CO2 migration and interactions in reservoir storage and evaluation of oil and gas reservoirs for CO2 storage potential, CO2 migration in saline aquifer storage to help advance CO2-EOR application in petroleum industry.